Still trying to collect my thoughts from my furious weekend at Gencon in Indianapolis, Indiana. First of all, what an amazing convention. It was huge, stocked full of cool stuff and interesting characters. I met amazing people, like artist Kayla Woodside, whom I plan on giving a lot of commissions to, and fellow Seventh-Star Saint Georgia L. Jones . I also sold more books there than I ever have at any one convention. Sounds great, right, but … before we get carried away and proclaim the Gencon experience the ultimate an author could ask for, let’s compare it to another fair I recently attended, the affable Stillwater Arts and Crafts Jamboree in Dayton, Ohio (basically, a Catholic bake sale). First, the hard numbers. 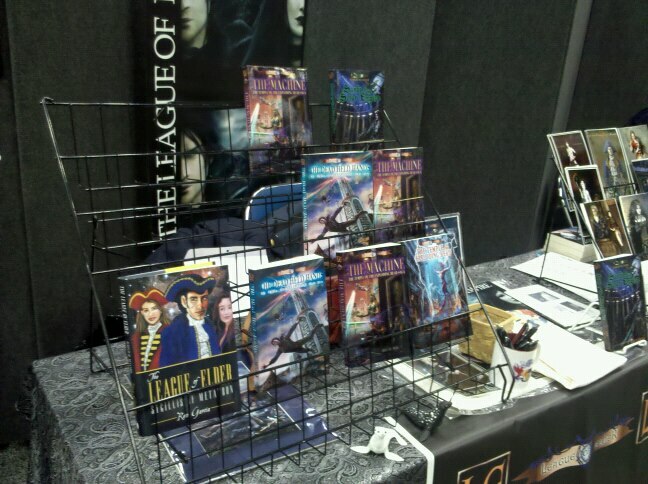 Over four days at Gencon, I sold a total of 64 books. I was able to sell all books in the LOE series, including the usually difficult to sell Book II and the Temple Trilogy which made me very happy. Meanwhile, at Stillwater, I sold 22 books in one afternoon. Comparing the two events, the Catholic bake sale actually out-performed Gencon by 30%–I didn’t sell as many books of course, but I was only there one day for four hours, while I averaged only 16 books a day over four days at Gencon. Just looking at the cold, hard numbers, the Bake Sale took Gencon down, it stands to reason–Gencon was a bewildering kaleidoscope of books, artwork, games, shirts, monsters, costumes and dice. Many people in a daze, walked past my table, smiled, and said “Just looking”. Some, who might have wanted to buy a few of my books, said they couldn’t find me again. There’s also the novelty factor. At Gencon, I was surrounded by artists and other authors while at the Bake Sale I was the only bookseller there amid a sea of oven mitts, aprons, cookies, cakes, doilies and other homemade treasures, the novelty of being an author of a book series was pronounced and a key selling point, while at Gencon it really wasn’t a big deal. One final note–my expenses for Stillwater were virtually nil, amounting to a $25 table fee and a tank of gas to get there, while Gencon carried significant expense. You would think that Gencon would be a den of vice and pagan idol worship, which it probably is, however, I’ve never seen all Seven Deadly Sins as vividly on-display than at the Catholic Bake Sale at Stillwater, especially the sins of Sloth, Greed, Pride, Envy, and, in some cases, Wrath as each home cook and artesian tried desperately to out-do the other. Money flew and I was the beneficiary with people buying merely to spend money. It was quite amazing to behold. So, next year, I look forward to another outing at Gencon, and I also look forward to another go at Stillwater where vice and all that goes with it makes for great sales. 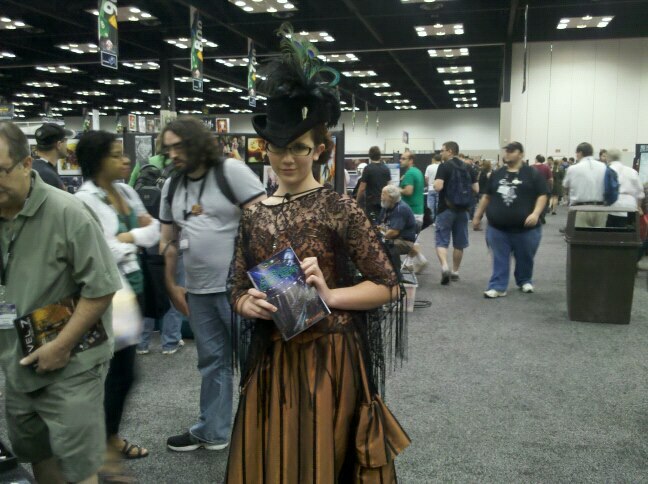 I am an Indy local and author, and GenCon’s writer’s presence is still a confounding one. GenCon’s audience, primarily, is gamers. Certainly, many of them are readers, but are they there to seek out books, or the games are rare collectible doo-dads tied to games that the convention has built it’s reputation upon. The Writer’s Symposium and the “Author’s Alley” are a work in progress. They get bigger every year, like a secret event within the event, but given the investment expected for such an extravagant weekend, it will be a couple more years before an author attends GenCon and outperforms that bake sale. Fair observation, thanks for sharing. I hope you otherwise enjoyed your visit to our city. It was a great show, that’s for sure. Gencon is a place where one can be at ease and indulge one’s passions. Books are included in that. Perhaps next year the Author Alley will be more central in the Exhibitor Hall, as this year it was sort of off to the side. Got lots of traffic, but most people passing through were just trying to get into the main part of the hall. I’ve no complaints–I thought it was a funny comparison, Gencon and the tiny Stillwell Jamboree. Ren, you are such an awesome guy. I’ve been hearing more and more about Gencon and some day I hope to make it there. Your breakdown of the two events is eye-opening. One might automatically assume Gencon would be the better seller since a lot of the attendees are already hyped for your genre, but a Catholic bake sale? Well done, my friend! I will keep this little nugget of information in my back pocket. So happy you did well at both events. Little events like bake sales and craft shows can be a gold mine. People like interactng with the creator of something, be it a pot holder or a book, and will be impressed. Some of my best days out have been at such shows, and they don’t cost a whole lot to attend. Of course, Gencon was productive as well, but it was a lot of work and expense. In this electronic age, conventions, fairs and other assorted gatherings may seem “old fashioned,” but thousands still go to them. I set up at my first last year selling books on local history — it was a conference largely populated by ghost hunters, bigfoot experts and UFO searchers — and sold nearly all of them. So when the “big” project is ready, I’ll be hitting all of these events.